Me et the iSchool Laboratory Library’s new Librarian & Instructional Services Manager (and iSchool alum! ), Alison Caffrey! We asked Alison what she’s most excited about doing in the iSchool Library, and she replied, “EVERYTHING! I love to have a lot of different projects to work on. I’m still learning the ropes, but I work with an incredibly supportive team that has been generous with their time, patience, and expertise.” She says it has already been very rewarding to talk with her colleagues and students about their ideas and determine ways to move forward with projects. Alison is also excited to work in a space that has changed significantly over the last year and to have the opportunity to pick out new furniture for the Library. Alison came into librarianship by way of precollege education. She started working for the Information Technology Academy as an office assistant while pursuing her undergraduate degree. After she graduated from UW-Madison (the first time! ), she worked with the Precollege Enrichment Opportunity Program for Learning Excellence (PEOPLE) for a year and a half before beginning a full-time position at UW’s Information Technology Academy (ITA). Alison says her position there included instruction, database management, outreach, recruitment, supervision, and a little bit of everything. She eventually became the assistant director and had just returned to that role after serving as the interim executive director when she left ITA for the school. A few weeks after leaving ITA, she started classes at the Information School and began teaching an undergraduate career development course with iSchool & J-School Professor Greg Downey. While a student in the department, she continued working with ITA in a limited capacity, but she focused on gaining as much experience as she could in libraries. Alison worked at the Kohler Art Library, Fitchburg Public Library, and College Library. In addition to teaching Inter-LS 210: Taking Initiative, she was a teaching assistant for LIS 202: Digital Divides and Differences in a Multicultural Society. 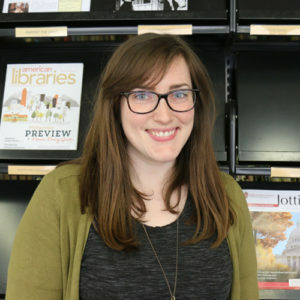 Alison says she met many great people through the iSchool, including peers, instructors, and professionals: “I had a number of formal and informal advisors who helped me realize the depth of my experience and translate it to the library profession. They also helped me recognize the areas in which I needed to learn more and directed me to where I could find those experiences. While in school, my vision of myself as a librarian shifted and expanded to allow for a wider variety of career trajectories, and I gained a great deal of experience in the areas that most interested me.” After graduation from the iSchool, Alison worked as a learning technology consultant at UW-Madison and learned extensively about the new learning management system, Canvas. Help us welcome Alison back to the iSchool, and stop by the Library to see her sometime!